I’m back from vacation, so things are returning to normal around here. Next time I take a break, I plan to invite guest bloggers to step in. Let me know if you’re interested in writing a piece or two for the site; I’ll slot you in over the next couple of months, and we’ll see where it goes from there. I want to get caught up but don’t have time to do a dozen posts, so here’s a month and a half worth of legal developments in virtual worlds — presented in the format of VB’s regular feature, “Quicklinks.” Enjoy. FBI Visits Second Life Casinos - In regulation news closer to home for most readers, Reuters reported that the FBI visited some Second Life casinos, but has not opened a formal investigation or taken a position on gambling in Second Life. There’s good analysis of the issue on Findlaw, from Anita Ramasastry, an Associate Professor of Law at the University of Washington School of Law in Seattle. If you’re feeling lazy, here’s a quick summary: caveats aside, under 2006′s Unlawful Internet Gambling Enforcement Act (UIGEA), it is almost certainly illegal for casino operators to accept bets in Lindens, and moreover, Linden Lab could be held liable for aiding and abetting gambling. 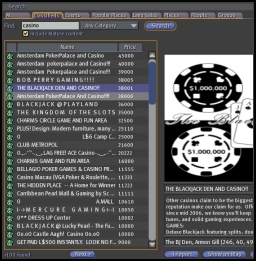 Another professor, Christine Hurt, from the University of Illinois School of Law, flatly states that users, “would be violating the Wire Act by gambling on Second Life.” A few days after the FBI’s visit, Linden Lab announced a ban on casino advertising, but at least so far, the new restrictions appear ineffective (see screenshot, above, of a Second Life Classifieds search for “Casino” two weeks after the advertising ban was imposed). If you’re interested in the case documents, the original declaratory judgment Complaint is here. Counterclaims are here. A proposed joint case management plan can be found here. The case management plan is an interesting document for non-lawyers to read, since it offers brief and readable statements by both sides of the facts of the case and the nature of the legal claims. Indiana Law Journal Runs Article on Virtual Law - I also want to highlight this from the Terra Nova article linked above, because it will be particularly interesting to VB readers: the Indiana Law Journal ran an article entitled On Virtual Worlds: Copyright and Contract Law at the Dawn of the Virtual Age. An Acrobat PDF of the full article can be downloaded here. The article is by Erez Reuveni, who is clerking for the Chief Judge of the District of Massachusetts. Linden Lab Removes Corporate Counsel Listing – Linden Lab, which had been seeking applications for a position as “Corporate Counsel,” recently removed the listing from its jobs page. VB contacted Linden Lab seeking further information, and will post anything we learn. Department of Homeland Security Considers Second Life Office – Government Computer News reports that the Department of Homeland Security is considering setting up a location in Second Life for training simulations and to use as a virtual meeting space. On one hand, I hope they don’t, because the more the U.S. government pays attention to virtual worlds, the greater the risk that some idiot will try to import the Chinese plan discussed above. But on the other hand, after seeing what griefers did to John Edwards’ Second Life headquarters, I imagine that the DHS office would quickly become my very favorite place to hang out in Second Life, just to watch the round-the-clock fireworks.